You will find a mirror in almost every bathroom, providing a service every day. They make it easier to try on outfits, get ready for work, shave, apply make-up and more. When the time comes to decorate or renovate, it can be hard to find room in the budget for this little trooper, as large models can be pricey. Many homes also lack the room for a wall-mounted model or even a little cosmetic glass. There is, however, a great solution to the problem of space and cost; the mirror cabinet. These little units are a great example of the modern trend towards utility, space saving and functionality; they literally do two jobs at once. 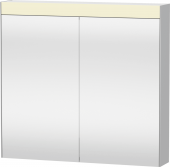 Mirror cabinets provide storage for your various bath soaps, make-up, medicines and other products and also provide a reflective surface. Better yet, they no longer have to be basic or boring. Designer brands produce a range of attractive cabinets that have contemporary style and might even be a good choice as a backup. Save a little space and money by looking into these cabinets when you next remodel. When you shop online, you can find great bargains and deals. When you start browsing around for a new cabinet, you will come across various types and brands. Narrowing it down is simply a case of looking at these common types and considering the needs of your room. Consider also how you intend to use the cabinet; does it need to be mounted above the sink for shaving, or sit in the corner as a spare when the sink is in use? Wall mounted. These units are simply attached to the wall, ideally above a sink, but consider a corner mount for even more space saving. Multi-door units. You can now get cabinets with several units arranged side by side, which is great if this is your main form of storage for the bath room. Illuminated. There are cabinets available with built in lights, ideal for brightening up the image and adding a little bath time luxury. Single or double door. Smaller rooms may benefit from a double door, as each door is smaller and will not swing out as far when opened. Whatever options you like the sound of, there are clearly ways to make the humble cabinet into a productive part of the room, without compromising on design. Remember to measure up the space to pick a cabinet that fits perfectly. Once you pick a type, you can look at the offerings of the latest brands. Keuco Edition 300 - Mirror cabinet 1trg. You don’t have to settle for a cheap cabinet that doesn’t match your design scheme. There are stores that sell elegant, modern units from brands that offer considerable discounts when you buy on the internet. Search around and you won’t be disappointed. For example, try the manufacturers Villeroy & Boch, Duravit, Ideal Standard and Keuco as a starting point; most makers in this level produce a mirror cabinet with LED lighting, making it much clearer to see. 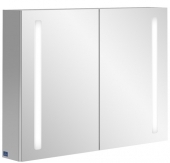 Villeroy & Boch produce the Frame to Frame range of sleek, spacious mirror cabinets. The Villeroy & Boch My View series has double doors and trendy strip lights. Take a look at Duravit for something functional, such as the Duravit Happy range with sensor-operated lights, a reflective rear wall inside and a wooden veneer. Keuco are known for multi-panel units with plenty of room and try Keuco Royal Metropol for wide units with fluorescent lights and crystal glass. Look into Keramag for a minimal approach. Keramag’s Renova range has thin light strips that will complement a contemporary bathroom. You can find similar with Alape; in particular look at Alape A Form for a very sleek, futuristic black unit. 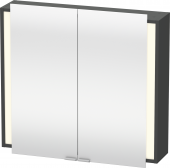 Ideal Standard’s Strada collection is popular for soft closing, seamless doors that suit a minimalist room. Ideal Standard also have DEA for cute, curvy cabinets that break the traditional mould. 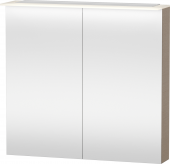 Finally, try Aquaris Theresa for a cabinet that also has open display shelves. These are among several modern brands that balance affordability and design. With a little research and planning, you’ll soon have the cabinet that perfects your bathroom space.